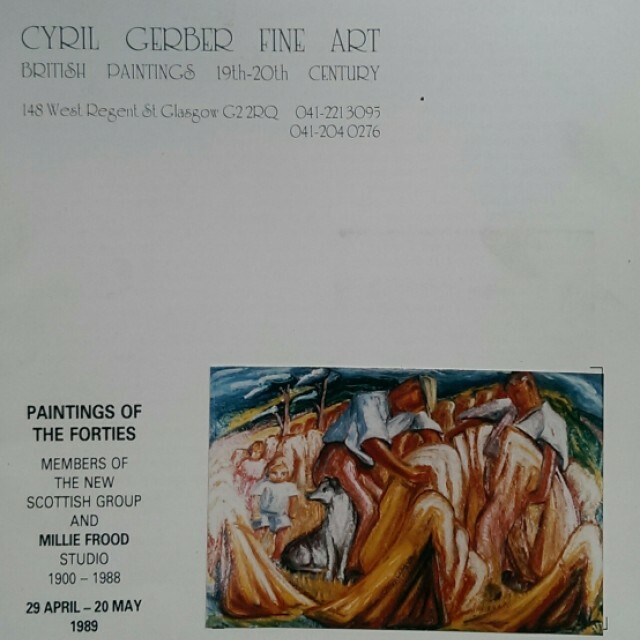 Millie Frood was born in Motherwell in 1900. She was the oldest surviving member of a movement which did much to revitalise the arts in Glasgow in the 1940s and 50s and had a continuing influence in the period following .She studied at Glasgow School of Art, taught at Bellshill Academy and had a number of solo exhibitions in Lanarkshire and Glasgow. Latterly her work was shown in the USA and Japan. The New Art Club started in 1940 and met twice weekly in Jean's Tea Rooms in Sauchiehall Street to discuss a wide range of subjects. Artist-members held an exhibition of their work each month. There was no selection committee. 'Qualified' and self-taught artists, young and old, hung side by side and members freely discussed each other's work. Fergusson and Margaret Morris, being older than the other members, tended to show their earlier works for fairer comparison. After a time the club found a more permanent space at the already established Margaret Morris Movement premises at 299 West George Street and the exhibitions continued there. Three years later in 1943 a number of the most active members decided to hold their first public exhibition. It took place in McClure's Gallery, Wellington Street and became the first exhibition of the New Scottish Group. The artists included Andrew Taylor Elder, Marie de Banzie, Donald Bain, Louise Annand, Millie Frood, Isabel Babianska, Anne Cornock Taylor, John Morrison, Betty Simpson, Sheila McArthur, Leslie Nurse, George Hannah, sculptors Helen Biggar, George B Innes, TS Halliday and of course works by Fergusson and Morris. The styles were varied and free, some with influences of Picasso, others of European expressionism. Later in 1951 and 1956 combined exhibitions of the New Scottish Group and Independents took place and included many contemporary artists such as Bet Low, Tom Macdonald, Maurice McChlery, Carlo Rossi, Alfred Avella and Alan Fletcher. Parallel with these developments were the foundation of Margaret Morris' Celtic Ballet Club in 1940, and the Celtic Ballet of Scotland in 1947, later named the Scottish National Ballet. These served as a focus for numerous Scotland-based musicians, composers, dancers and painters. Designs and costumes were commissioned for the productions from such artists as William Crosbie, Josef Herman and numerous Group artists. Millie Frood later did the costumes and design for a ballet in 1961. The achievement of the Group was the great encouragement it gave to serious artists of varied backgrounds, providing them with a reason to paint and an opportunity for free exchange of opinions on art. For the public it provided a new kind of introduction to the art of the period. Millie Frood took part in all the Group's exhibitions and was an artist who both responded to and benefited from the inspiration and vigour of the Group. We have used this occasion of this exhibition of her work to show as many examples as possible of the other members and associated Independents. The exhibition also includes examples of works by members of the New Scottish Group and associated artists: JD Fergusson, Margaret Morris, Marie de Banzie, Louise Annand, Donald Bain, Helen Biggar, Betty Simpson, George Hannah, Maurice McChlery, Carlo Rossi, Alfred Avella, Nathaniel Smith, Josef Herman, Jankel Adler, Bet Low and Tom Macdonald.